APPEARANCE: Jami is a general term for evil spirits. They are a subset of of chimi, or mountain spirit, though they are much more renowned for their nastiness. The term is not a clearly defined one, but in general they are manifestations of the ill will of the mountains and forests, awoken in order to do harm to humans. INTERACTIONS: Jami are truly wicked and harmful towards people. 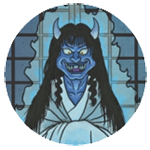 Because there are so many different wicked spirits that can be considered to be jami, there isn’t one particular behavior or danger specifically ascribed to all jami. However, one common trait is that jami are accompanied by sickness. They are capable of possessing and inhabiting human bodies, infecting sickness and disease upon their human hosts. 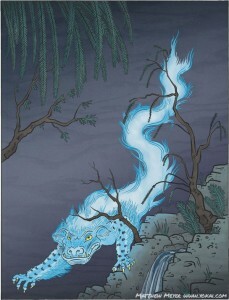 ORIGIN: Along with chimi and mōryō, jami first appear in ancient Chinese histories describing the nature spirits that roam the land. As Chinese culture began to influence Japanese culture, these ancient books became known to Japanese scholars, who incorporated their teachings into their own works. When these creatures were included in Japanese bestiaries and records, they became associated with various Japanese evil spirits. LEGENDS: In the ancient Chinese hagiography Biographies of Divine Transcendents, a wise sage named Ōyō was able to cure sick people by drawing an image of a prison on the ground. He would then call the evil spirits out of the body of his patients. When the spirit came out, it would become trapped in the prison and the patient would be instantly cured of his sickness. The evil spirits trapped this way were said to be jami.